Julie Gabriel preserves buildings, but not in the way you might think. 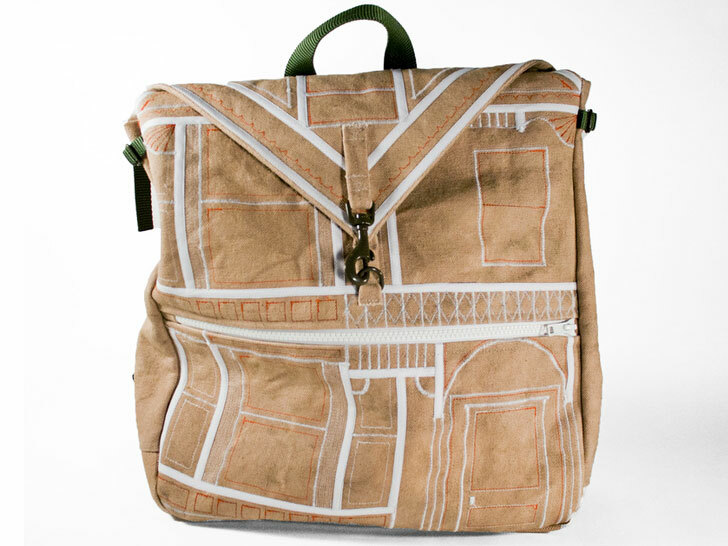 Using hand-dyed canvas and thread in lieu of brick and mortar, the Houston-based artist recreates abandoned structures and “historically significant architecture” as backpacks. “The crumbling bricks and peeling paint are proof of a life lived that deserves a little recognition,” Gabriel explains on Martha Stewart’s “American Made” contest site, where she’s listed as a nominee. “A backpack allows the building to maintain its original purpose of shelter while giving it the freedom to explore the world outside its own front door. No longer planted in the ground, this structure can now be carried on your back.” Your home away from home, as it were. Julie Gabriel preserves buildings, but not in the way you might think. Using hand-dyed canvas and thread in lieu of brick and mortar, the Houston-based artist recreates abandoned structures and "historically significant architecture" as backpacks. "The crumbling bricks and peeling paint are proof of a life lived that deserves a little recognition," Gabriel explains on Martha Stewart's "American Made" contest site, where she's listed as a nominee. "A backpack allows the building to maintain its original purpose of shelter while giving it the freedom to explore the world outside its own front door. No longer planted in the ground, this structure can now be carried on your back." Your home away from home, as it were.